If you enjoy drinking coffee then two terms you’re likely to come across are “coffee blend” and “single origin coffee.” This article is aimed at amateur coffee drinkers who are looking for more information. Here, we aim to explain the key terms and help you understand how and why we create coffee blends at Pollards. A coffee blend is a coffee which is made up of coffee beans that originate from more than one place. This could be more than one country, or also it can mean on a smaller scale. On a very micro-level division of place, it can refer to varying altitudes on the same producing farm, or it can mean different regions of the same country or different small areas within the same producing region. From this little piece of information, it is clear that coffee blends come in many shapes and forms. 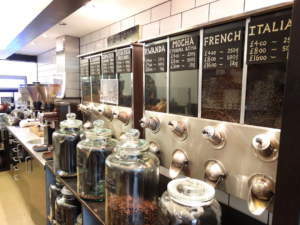 Commercial coffee blends found in coffee chains, all the way to ‘single origin’ coffees. A single origin is, now seemingly self explanatory, a coffee which is sourced from the same exact origin. The common mistake here is that people can confuse single origins as single country, which would be incorrect. Not all beans from Brazil, for example, are the same. The variance in attitude, weather, farmer, soil and even the crop can differ. Robusta and Arabica beans can both be grown in Brazil, but the flavours and quality contrast significantly. Simply put, the roaster controls the blend. At Pollards, we treat a blend like a recipe. We combine different flavours to strike overall balance, while producing complexity of flavour. Blends are where we create the perfect taste potential for a set market preference / specific customer demand / bespoke brewing method, allowing the end user to brew it in an accessible way at home or in service. We cater for a variety of tastes and have an actual recipe book of all of our blends. This is our pride and joy, a closely guarded secret for all roasters and the key to our success. Why would you blend coffees? Blending is done for a multitude of reasons. The most common reason is as a way to meet a certain price point more easily without sacrificing available flavour. 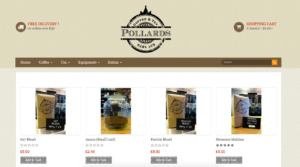 As a wholesale coffee roaster, Pollards need to cater to lots of smaller retailers who require bulk coffee at an affordable price. Often mixing a blend can provide a satisfactory quality coffee for a fraction of the price of a full high quality single origin, which proves very popular and therefore more expensive. Another reason could be that a blend offers more of a complex flavour profile to suit various flavour presences or needs of our customers. The main reason for us at Pollards, is as a quality control measure. Blending different coffee beans helps to balance a flavour well. Changes year on year affect the taste of the beans. For example, coffee from a plantation in 2017 taste slightly different to the same plantation in 2018. This is due to the weather mostly. So in order to keep one single flavour in our blends we can combine different proportions of beans in order to create a predictable taste. If you buy our Puccini beans then they will produce the same great tasting coffee each batch, over the years. Puccini is actually our overall best selling coffee, so it goes to show how important blends can be. Why do we see blends more than just coffee from one source? Pollards and other roasters often blend coffee to produce a complex overall flavour that cannot be produced by one single coffee varietal. Each coffee bean only has a certain set of intrinsic flavours, so we have those and only those to work with and develop. In contrast to a coffee blend, a single origin coffee comes from just 1 “origin”. The interpretation of “origin” varies depending on who is selling the coffee. Many coffee chains will call a coffee a single origin if all of the component beans come from just one country. The problem with defining a single origin by country, is the fact most coffee producing countries will include varying micro-climates and conditions. This means by lumping them altogether. With this, you fail to celebrate the specific nuances and subtle flavours, distinctive to a certain farm or co-operative. These coffees are often highlighted and celebrated within the speciality coffee community. This is because they help showcase the purist flavours from specific coffee beans. This is where coffee can get complicated when recommending coffee. When you are new to coffee, you may hear someone say they like ‘Columbian’ and try a random columbian coffee. You may find it unappealing so you discount the entire country for future purchases. In reality you could be just eliminating one farm or even one seasons harvest. When it comes to single origins, flavour can vary each season, each year and for each farm or plantation. Good news is; you will never get bored, thats for sure. Creating the perfect coffee blend largely depending on your ability to grade and score individual coffees. This is where our master roaster comes in. Professional roasters can help identify what kind of flavours a certain type of coffee bean would contribute to a blend. This isn’t an easy skill, and involves training and Q-Grading qualifications, alongside years of experience. Creating a coffee blend is a careful procedure and you can’t simply throw some different coffees together and hope it tastes nice. Instead it’s a very scientific approach of working with flavour profiles and the ability to understand how to combine them to create a desired end-taste. 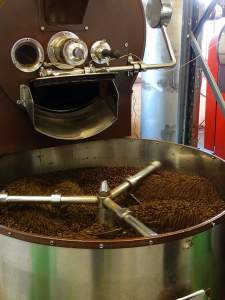 Get Started with our House Blend or we can make your company blend from scratch! Or you can buy our coffee direct from the retail website!